Students, Honda associates and Ohio State faculty gathered in Scott Laboratory on Thursday, October 18, to learn about Honda-sponsored capstone projects summoning the intelligence and ingenuity of more than 100 senior engineering students of various majors from now until the end of the next semester. Students Amber Bollinger (left) and Brett Miller present their group's work at a showcase of Honda-sponsored capstone projects on October 18.This year the company is sponsoring a record-breaking 23 capstone projects. Shubho Bhattacharya, associate chief engineer at Honda North America, Inc., said that these projects play a key role in building a relationship between Honda and its future engineers. Each capstone project has a different goal upon completion. Some projects are focused on improving the design or capability of Honda products, while others are working to reduce the environmental footprint left by the company. Project teams range from students in a single engineering major to multidisciplinary teams from various engineering and non-engineering disciplines—such as business—who all work together to address the open-ended challenges. 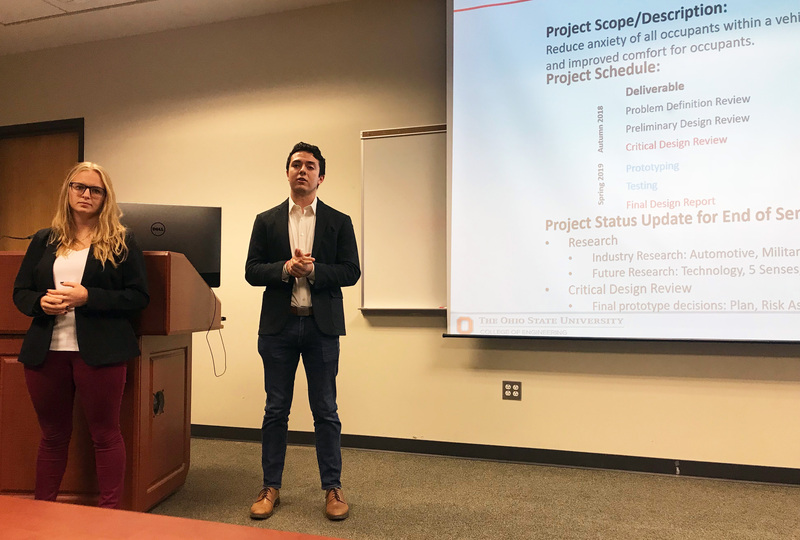 Last year, one of the capstone teams began working on a project that aims to produce a prototype of a vehicle seat that can detect and reduce the driver’s anxiety. This year, a new multidisciplinary group is continuing that work. At the event, Associate Dean David Tomasko explained to students that by participating in the Honda capstone program, they would be gaining experience that will help them in the field once they graduate. “We’re not about giving you a degree that trains you for a specific job, we’re about giving you an engineering degree that trains you to solve problems of the future that you don’t even know about yet,” Tomasko said. Dean David Williams stressed the importance of hands-on learning, which is the core of the capstone program and the reason all engineering students spend one to two semesters working on real-world problems before graduation. The Honda-sponsored capstone projects are part of the Honda-Ohio State Partnership, a bilateral collaboration between Ohio State and Honda that supports initiatives in education, research and public service. Learn more at honda.osu.edu.